As it turned out, Waterloo already defined the qualities that Deere had been looking for to satisfy its customers. The company was ready to create a tractor that provided everything customers were looking for in a machine – reliability, adaptability, and durability out in the field. Let’s take a look back at how John Deere’s deal with Waterloo made its mark in history. In this video, John Deere manager of corporate archives and history Neil Dahlstrom takes us back in time to when Deere’s relationship with Waterloo was in its early stages. In Moline, Illinois, Dahlstrom showcases a 1920 John Deere Waterloo Boy tractor, one of the first of its kind at the time. As he explains, Waterloo was acquired by John Deere back in 1918, marking the company’s entrance into the tractor and engine business. Through trial and error, Deere was finally able to refine its tractor model to fit the needs of its customers, who wanted nothing more than a durable machine to use out in the field. The John Deere Waterloo Boy debuted in Kansas in 1918, but it wasn’t until 1920 that the two brands truly came together. The tractor got its first makeover, sporting John Deere’s green and yellow colors, as well as its leaping deer logo. 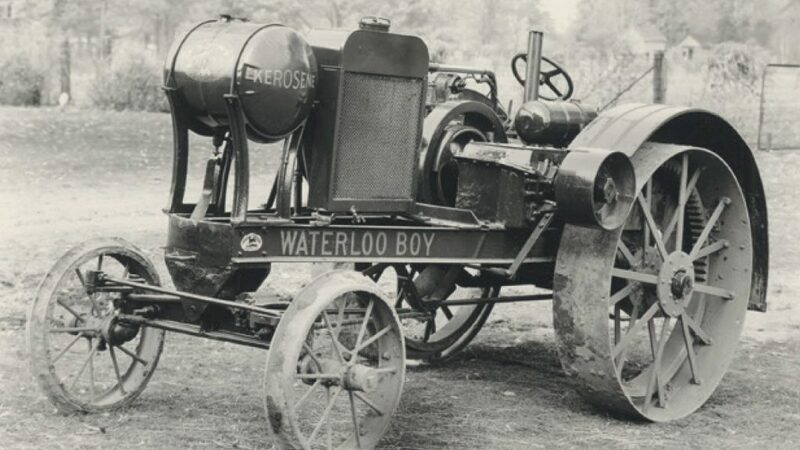 Today’s John Deere tractors have come a long way since the original John Deere Waterloo Boy. The company continues to make improvements to its lineup of tractors to better serve its customers and their evolving needs.